Around a hundred people gathered in a small Camden pub on Monday night for a meeting called by the RMT at incredibly short notice. They were there to support Mark Harding, a longstanding RMT activist, rep and branch secretary who is the victims of an outrageous and politicised anti-union prosecution. Kieran Crowe, a TSSA union activist, writes in a personal capacity. The RMT and TSSA transport unions held a major strike last week on the London Underground, directed against Boris Johnson breaking his promise to keep ticket offices open. Mark had been delegated by his members to for picket-line duty at Hammersmith station. The British Transport Police took no action of any kind against people who verbally abused pickets. But they arrested Mark on a public order offence when a strikebreaker accused him of calling him a scab and intimidating him as he crossed the picket-line. Mark spent 13 hours in a police cell. During this time the charge against him was upgraded to a breach of trade union law under the Serious Organised Crime Act. Initial bail conditions prevent Mark from conducting any of his official trade union duties. It was not even clear until the last minute whether he would be able to attend his own support meeting. Mark is protesting his innocence and has witnesses in his defence. His supporters come from across RMT and TSSA, as well as Aslef and many others including PCS and Unison. The turnout of solidarity is is a testament to the sheer number of people that Mark has personally helped or advised over the years. Mark stressed on the night that the case is not simply about him: it was an attempt to criminalise and intimidate the whole labour movement. This afternoon RMT and TSSA suspended a planned 48-hour action following progress at ACAS talks. But the unions are still fighting to save a thousand jobs on London Underground. 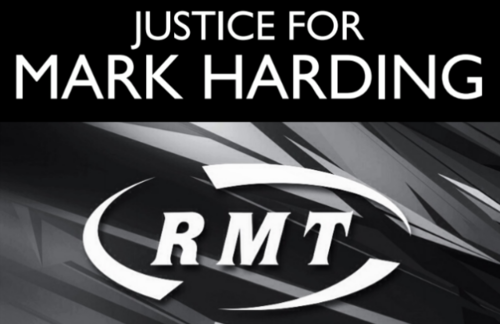 Trade union activists must defend Mark Harding and back the fight to save jobs and services on the tube. The People’s Assembly has launched a Hands Off Our Unions campaign against legal harassment of trade unionists. Its launch rally is tonight in London with Len McCluskey and Mark Serwotka.